2017 will be the fourth time that MAVEX have exhibited at Olympia Beauty and for the first time, they will be demonstrating the exquisite and highly active, results driven MAVEX facial ranges on their Stand: B39. Characterised by luxurious textures with high concentrations of new generation, active ingredients such as Ganoderma extract, bio-active carbon, Ratania root & stem cells of Edelweiss with gentle, natural aromas. 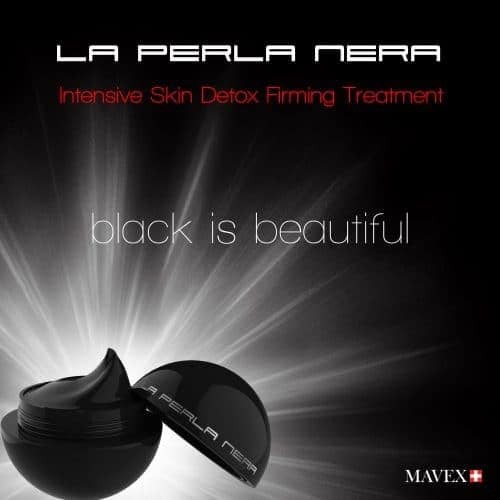 La Perla Nera, a bio-active carbon detox facial range, is a powerful and results driven in salon treatment; a beautifully smooth & shiny, thick, black Active Carbon Facepack that feels cool and relaxing on the skin. Following the cleansing stage with either the La Perla Nera Super Cleansing, or Forever 2-in1 Cleansing Milk, the Facepack is applied with a brush in a generous layer over the face following the cleansing stage. It is left for 10 minutes to work; drawing toxins, dirt and impurities away from the skin, and removed before it dries out. The skin is then cleansed again using the gentle Forever Almond and Jojoba Scrub to remove all traces of any toxins that have been brought to the surface. The next stage is the application of the Active Carbon Intensive Face Serum, which instead of water uses 100% pure magnolia distillate instead of water. This immediately gives firmness and tone to the skin, while also providing deep hydration from the combination of high & low molecular weight Hyaluronic acid. Extract of Edelweiss prevents collagen & elastin degeneration while fighting free radicals. The treatment is finished with one of Mavex’s luxurious moisturisers; Forever 24hr Cream or La Perla Nera Intensive Skin detox Firming treatment, leaving skin feeling incredibly clean, toned, brightened and hydrated.